Provides exceptionally smooth dimming of LEDs and other light sources dimmable by leading-edge phase control. 0-10V rotary dimming and switching. RPC Push-control Dimmer fits or clips into wall plates and grid systems from UK wall-plate manufacturers. Allows up to four Take Control Rotaries (TCR) to be positioned around a room or building, with each seamlessly taking control of switching and dimming. Multi-channel scene-setting system with up to four scene-select Wall Plates, each with a choice of six scenes (four moods plus full ‘on’ and ‘off’) for any number of lighting channels or circuits. 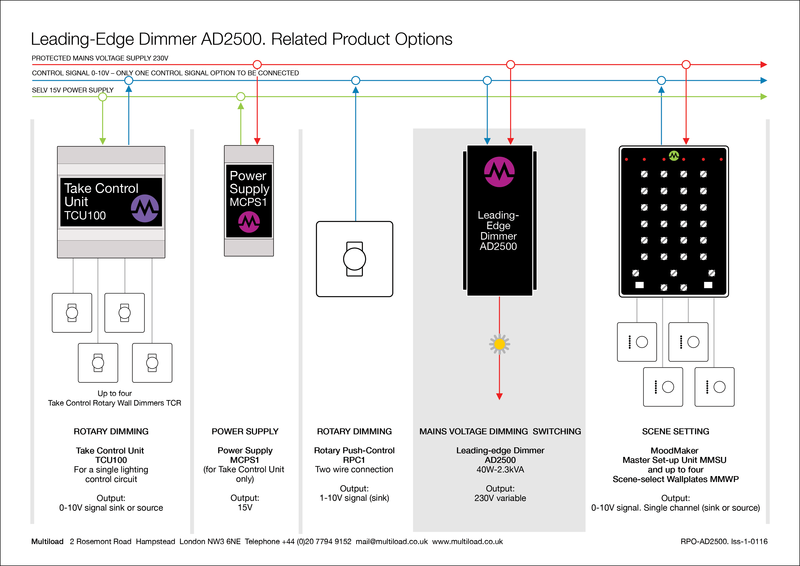 AD2500 can be used with any lighting control systems or products providing 0-10V signal control outputs.